Get off that Outlook Calendar! Know when the materials arrive, schedule the job, and notify your installer all in one place. With SureFire ISS Notifications Feature, you can subscribe to text/email/in-system notifications that automatically update everyone as the job progresses. Schedule the install and pay the installer all in one screen. Real-Time Updates allow you to know exactly what's done, and what still needs to be done. 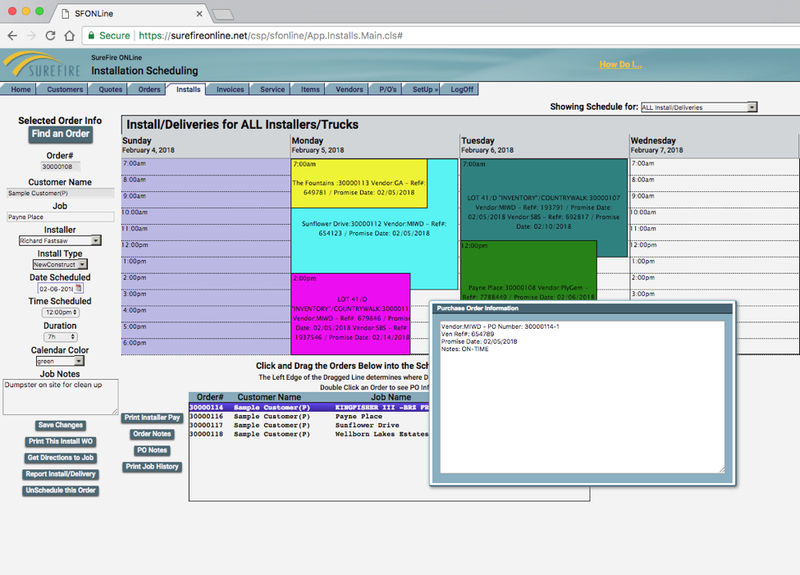 Purchasing integration allows installation schedulers to keep up-to-date on the status of materials. Check the PO Info, Schedule the Install, and Text the Installer – In Five Clicks! Look professional to your customer, without a ton of work. Branded Customer Order - YOUR logo, YOUR descriptions. Automatic Installation Labor and Supplies (Cost and Markup) added. Order Notes File Keeps Track of all the details, forever. Sales Reports - Summary and Detailed Reports of Sales, Cost of Goods, and Margins. Up to the minute Job updates - Get notified via Email/Text/In-System Messages of events. 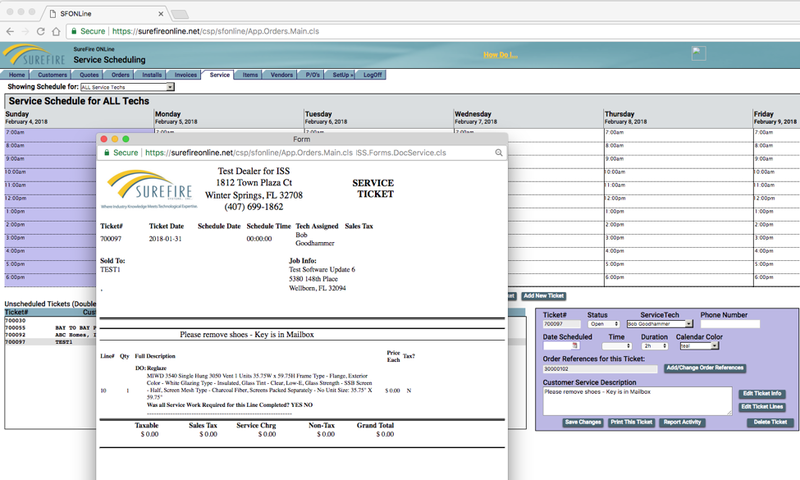 Watch a REAL import into SureFire ISS from an MFG’s quoting tool. We know that Service makes the difference. Schedule your services all in the system - connected to the original order, installation, etc. Create Service Tickets right from the Installation Debrief - Broken Glass? No Problem. Notify Your Service Team About New Appointments Automatically Via Text, Email or Both.